Given the rising emphasis on environmental disclosures and the expressed importance of 'good' governance in determining the extent of information disclosure in general, we examine the relation between specific aspects of governance and media coverage and the quality of voluntary environmental disclosure (VED). Using a sample of 127 firms over a six-year period (2000 to 2005), we empirically test characteristics of governance and media in relation to VED. Our results suggest that VED quality is positively associated with environmental media coverage, negative environmental media and board attributes of independence, diversity, and expertise. Results from supplemental analysis suggest that institutional investors exert influence over managerial decisions on environmental reporting only in the face of negative environmental media. 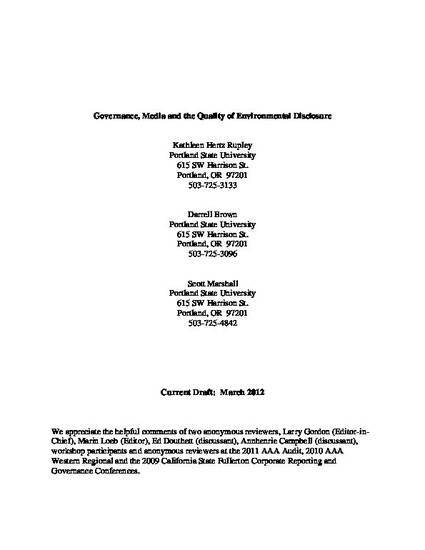 Additionally, results from longitudinal analyses indicate that the quality of environmental disclosures increases over time. Our conclusion discusses the implications of these findings.